Giving the dog a choice, prevents bites. I continually see the need for more education in cases of dog aggression towards humans. 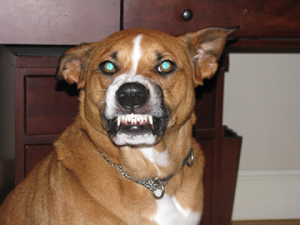 For some reason, when a dog growls at a human, the human’s response is to yell, hold them down or force it into confinement. Many clients admit this scolding has caused an increase in stress when the dog is near unfamiliar people. Good dogs resolve conflict — all by themselves! 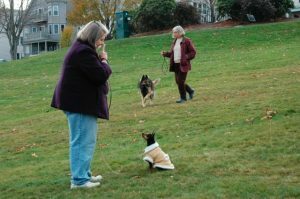 Below, I outline an incident that occurred at a local park in detail and include what each dog’s body language indicated. There are good lessons here on how dogs resolve conflict and set the rules for the playground! First we have Mo, a scruffy adolescent female terrier weighing about 20 lbs., who enters other dog’s space quickly and without hesitation. Next we have Nel, a shy adolescent female of about 40 lbs. who approaches other dogs hesitantly when greeting. Our third dog is a small 10 lb adolescent male named, Arlo who would sniff all the dogs and then run away and pee on the nearest tree only to repeat the pattern again. 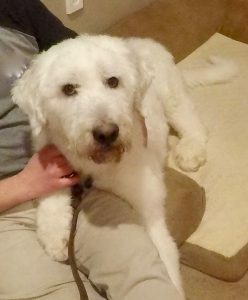 Finally, there is Ann, an adult 55 lb female who enjoys chasing squirrels mostly, and was extremely tolerant of other dogs sniffing her. This is when it gets interesting! This is an example of the scene, terrier closing space and insecure dog baking away. Ann, Nel and Arlo had just politely greeted each other moments before when they spotted the gregarious Mo trotting towards them from a distance with head and tail up. 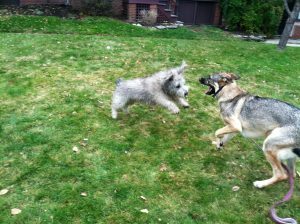 From about 30 feet away, Mo began to sprint and squared off and growled nose to nose at Nel. Nel stepped back about 6 inches from Mo when Ann stepped in with a reprimand. Ann chest bumped Mo right on her back. This is when it gets noisy! That is when it got noisy with both dogs growling as Ann stood over Mo and reprimanded her by holding her down with her mouth. I could see Ann’s mouth was open and was fairly sure she was not biting down. I quickly stepped in to separate the two, and Mo ran away. This is an example of the scene, but not the actual dogs at the park. Ann never even look at me, which was much appreciated as some dogs will redirect if they are too aroused. She was not. Ann immediately relaxed, and I do not even remember her shaking off. Next, Nel walked over and licked Ann’s face, possibly in appeasement. This is when Mo should have stayed! Mo’s mom was screaming at the top of her lungs saying what a bad dog Ann was and that Mo just had “poor social skills”. I attempted to tell her to put Mo back down so that Mo could resolve the issue and learn from it. I was certain that Ann was quite calm and had resolved the disagreement quickly. But Mo’s Mom was upset, even though she knew that Mo was not even scratched. She left without understanding that her dog was the one that started the conflict and most likely learned an important lesson. Ann was truly just reprimanding Mo for being rude to Nel. Period. If you own a dog that quickly charges into unfamiliar dogs faces and growls or gets even mildly stiff, avoid allowing this to happen. It is a matter of time, before your dog “with poor social skills” gets put in it’s place by an adult dog who is confident enough to do so. You might complain that your dog was “attacked”. However, if there is minimal damage, it means your dog just received a reprimand for being rude. It is often just that simple. The adult dog should not be punished for reprimanding and setting rules on the playground. Mo is clearly an insecure dog and selected the shy dog Nel to bully. Thankfully, Ann was there to keep the peace! This is what you can do: Slow down the introduction. After 5 minutes, this beagle never looked at the lab. The bagle was saying “no thanks”. 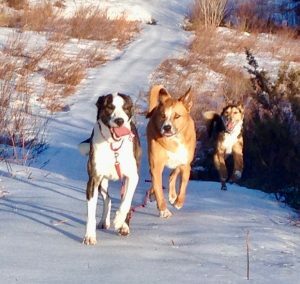 Begin by walking your dog toward the other dog on leash, but stop about 15 feet away and let the dogs communicate a few seconds. Call them away and repeat. The insecure dog will eventually learn to read other dogs cues from a safe distance as they mature. I use a very slow approach to be sure both dogs want to greet. If one dog is looking away, turning away, or ground sniffing, then you do not get any closer. However, if both dogs are still expressing loose body wiggles after 5 minutes of parallel walking, then continue to get closer. Why does my dog respond that way? Have you attended a dog training class, maybe a Leash Lunger or Reactive Dog Class? You see other dogs in class improving, but your dog continues to scan the environment instead of looking at you. Some of these dogs still lunge at dogs, but they have met each other and no longer have a need to be persistent. When a client brings me a dog, I begin with identifying who the dog is prior to setting any expectations. Each dog is an individual, and will show you how they will respond if you know what to look for. I will share a recent consultation with you below. Dog: Stella, 2 year old spayed solid black German Shepherd in good health. Lives with her mom and a 4 year old child who she enjoys being with. History: Stella does well in daycare, and never shows aggression to any people or dogs. They describe her as tolerant of the young adolescent dogs and will play with any dog that engages her. Mom says she allowed Stella to greet other dogs on leash when she was a pup to socialize her, she has never acted aggressively with any dog she has met. Owners Complaint: Stella’s Mom complains that she cannot walk Stella on a leash, as she pulls extremely hard to get to any dog she sees in her environment. Even if she puts treats to her nose, Stella will not reorient to her, she physically has to pull Stella away. When I observed Stella’s behavior it was immediately apparent that she was extremely visually aware of her environment, as she constantly turned her head to anything that moved. She is fairly high energy and trots, not walks, to whatever interests her. When she saw a bird over her head in the tree, she stood still staring at it for several minutes, not moving a muscle. When her mom called to her, she ignored the calling and remained focused on the birds as a second bird joined the first one. Finally, her mom said “Stella, want a treat?”, Stella twitched her ear and then looked at her mom, then returned to watching the birds for a several seconds before responding to her mom for the treat. Once she ate the treat, she trotted back to the tree and visually watched anything that moved. Stella showed us that she is extremely visually aware of her environment and she is very persistent in this visual behavior when the stimuli is interesting to her. She also showed us that she is not willing to come to us, unless she knows the reward is worth it to her. She has her own interests and is persistent when something interests her. She also loves playing with all the neighborhood dogs. Would Stella likely be a leash lunger? Yes! Now you see how the combination of her temperament plays a significant role in her (response) behavior. What key change could Stella’s mom incorporate in her leash training? Increase the value of the reward to something that Stella finds very rewarding. We determined she liked dried liver extremely well. Effective behavior modification programs work on many dogs but will not work completely if your dog loves dogs, is visually persistent by nature and is not very food motivated. When this is the case, patience and understanding is key! I am having trouble getting this pups attention as she is extremely aware of her environment, loves dogs and is somewhat food motivated. Patience is needed here as we allow her to be who she is. If you are wanting to change your dogs behavior, first try looking at your dog to see who they are, what is their nature, their temperament. Some traits to consider: sociability with people and dogs, patient, vocal, high energy, lazy, becomes extremely aroused when near people or dogs, biddable with or without food, visually or olfactory aware and persistent. Understanding who your dog is will help you understand WHY she responds the way she does. 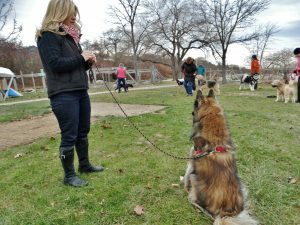 As a dog trainer, I often work with dogs who have bitten people, yet I am able to hand feed and often begin body handling them without getting bitten myself. 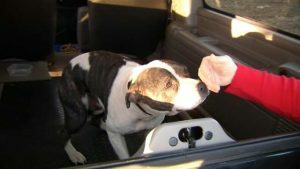 Since dog bite prevention is a critical focus of my reward-based dog training, I will share some simple techniques to reduce your chances of being bit by a dog. If the dog is facing you, look for signs he is calm and relaxed. These would include a loose body (free of tension), open mouth, relaxed ears, soft blinking eyes, relaxed neutral tail and ears. These are communications signs from the dog that he is feeling okay about you near him. This handsome boy is offering me friendly relaxed body language as he stands at an angle showing he is feeling comfortable about my presence. If the dog is facing you with a closed mouth, or a non blinking eye, with body weight forward, or stiff, or eager to get to you in an aroused state. He may be saying stay where you are. This cute fuzzy face is facing me directly with his head and neck raised up, closed mouth, still body, with round eyes that are not blinking. All signs the dog is unsure, and asking me to stay away. Consider the history: Dogs who have been physically grabbed, alpha rolled, held down, and dominated are 100% more likely to feel stress when approached by a stranger. These dogs often panic, are unable to think clearly and overreact to a strangers approach by lunging, growling or snapping as their safety is paramount. Dogs who have not experienced positive associations with humans will be less trusting and may take a while to trust. The dog must set the pace in the relationship. What do I do to avoid being bitten? I stop moving, turn my face away, raise my chin up and slowly turn sideways to the dog, relax my joints as I take a deep breadth. IMPORTANT! I never reach my hand out (BAD IDEA). I Begin by asking the dog to come into my space. If he looks at me then looks away, he is telling me he is worried and I should not approach. If you ask a dog to come to you and they turn away, let them be. This dog is removing herself from what she perceives is a scary situation. If the dog is displaying low body compression, curved back, I will often get low and turn slightly away, offer a toy or treat to the dog, if he moves towards me, then I engage by tossing a toy or treat. I wait and see if the dog stays in my space or immediately retreats. A dog who immediately moves away or maintains a forward stance is not ready to be petted, this is a low level distance cue and should be respected. How can you make Friends with a territorial Dog? 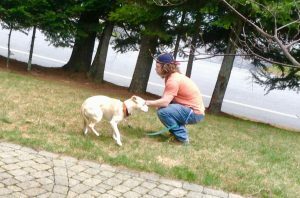 Treat and Retreat is a progressive training program I use to build a trusting relationship with stressed or conflicted dogs. This is simply a game to reduce the dogs stress as I am in the dogs presence, this is not about petting the dog. 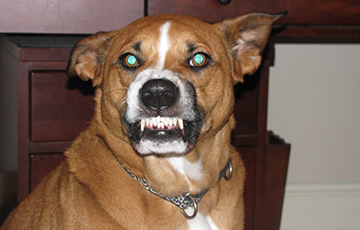 Reducing a dogs fear will reduce territorial aggression, leash lunging, air snapping, and biting. Click the link to view a video of me playing Treat and Retreat with a shy dog. A dog who approaches me and leans against me has invited contact. I can slowly pet his back one or two strokes and then stop, to observe the dogs body language and wait for the dog to invite more contact. A dog who turns his face away should not be appraoched. A dogs relaxed body language, often offered by a dog at feeding time. Open mouth, soft eyes, relaxed loose jointed body, neutral tail and ears. Fearful/stressed body language, often offered at the vets. May include stiff or curved body, slow body movements, tucked tail, looking or turning away, tightly closed mouth, wrinkled brow, refusal to eat treats, lowered head, growling or lip curling, ears pinned to head, paw lifted, whites of eye showing. Have a plan when you see the dog. If you do not have treats on you, ignore the dog completely. With high value treats on you, you can begin the Treat and Retreat game. The dog always sets the pace, if the dog attempts to look or turn away, just stop and ignore the dog. Give the dog a break, sit down or start farther away from the dog. 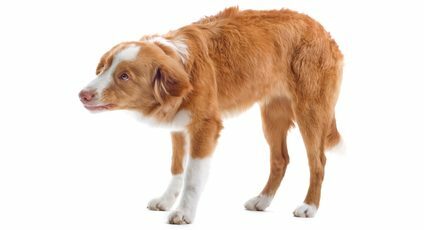 If the dog begins to bark or lunge at you then slow the progression down as you are just making him more fearful/stressed. Dogs give plenty of warning before they bite, it is up to you to ignore any dog that is not seeking out your touching. With the above advice you will be able to slowly make friends with fearful/protective dogs without pushing the dog to the point of using his teeth to resolve conflict. I have added a few photos below for you to practice your observational skills in reading dogs body language. Stressed as shown by her rounded, compressed rigid body, moving away, closed mouth, ears way back, tail dropped. My scottie, Sophie is not happy about this stranger petting her. Most humans are comfortable greeting others by stretching out their hands, and making direct eye contact. As a result, humans often interact with dogs in human ways, including but not limited to, quick hand movements, forward social pressure, leaning over, staring directly at the dog and sadly, reaching out. Haptic communication is a branch of nonverbal communication that refers to the ways in which people and animals communicate, and interact via the sense of touch. Again, it is normal for humans, but rude and scary for many dogs. Most dog owners want a dog that will willingly accept being petted, even by complete strangers. When children are involved this is even more extreme, with dogs enduring fingers in their mouths, ears and eyes. It is true most dogs are social and do love a good scratch, let’s just not assume they like it from a stranger. Touching a dog should only be done if the dog chooses to make contact with the person, avoid approaching dogs and DO NOT reach your hand out to let them smell you. Seriously, I can think of several dogs that have bitten, specifically when a stranger reached out. Based on this dogs body language, she is enjoying be scratched. I suggest you ask your dog and see how he or she feels about being touched by you or a friend. Call your dog into your space and begin to pet her with two hands for just a few seconds, then stop and lean a bit away. If your dog moves away just a bit or shakes off, then your dog is telling you that at this moment, in this environment, that touching was not very rewarding. If however, your dog leans into you and asks for more touching, then your dog finds this interaction rewarding. Watch your dogs body language in different environments, and he will tell you how he feels about the hand that is coming closer to him. Old School training would have told you to hold your dog down for growling or snapping at a friend. This use of force will only increase the dogs fear and will break his trust in you completely. 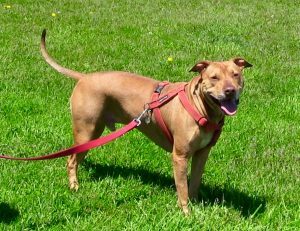 Fearful dogs that are handled with force often get worse over time, and their behavior can escalate to a point that people think euthanasia is the only solution. Fortunately, there are steps for changing how your dog feels about being touched. Please note, if your dog is showing severe aggressive signs, or has bitten already, contact a behavioral specialist for professional help. To teach our dogs to be comfortable with body handling, I recommend you use a traditional counter-conditioning/desensitization program (CC/DS). While each program is unique to each dog, here are some general and important things to know about CC/DS. My Experience: Not all dogs feel relaxed with a human hand coming at them. My own dog growled at my children for about three years before he learned to trust them when they were petting him with one hand. 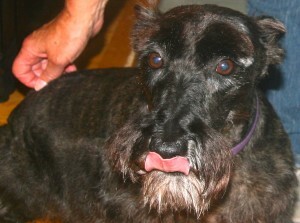 In addition, my scottie nipped many hands as strangers would reach out to touch her. Both rescue dogs took over a year to learn to tolerate being touched by a strangers and much longer to enjoy it. Take it Slow: It is critical that you never push the dog to the point of being scared or stressed. Because of this we can only ever move as fast as the dog will let us. Yes, the dog sets the pace. Depending on the severity of the dog’s anxiety around being touched, this process may take as little as a week or as long as several months. 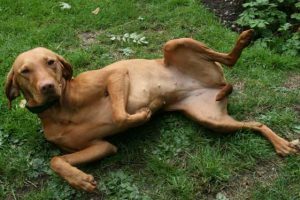 For dogs that have a history of getting defensive or aggressive when touched, you will want to go even slower to prevent your dog from getting overwhelmed and snapping. Have a Plan: It is a good idea to write out the steps you plan to take for the CC/DS program. This will help you be sure to move very slowly, and not try to skip steps that your dog may not be ready to skip. You can change the plan as you go, either taking more or less time depending on your dog’s response. Make it fun: For this systematic desensitization program to work, you must always stay below a dogs “threshold” — this is the point where your dogs fear is so high, he is shutting off the thinking part of his brain. In order for this not to happen, you must stop if your dog begins to show signs of anxiety or fear. Just because your dog is not trembling or fighting to get away does not mean he is completely relaxed about the process. If your dog panics, shows signs of significant stress or anxiety, does not recover quickly or refuses to eat, you have moved too fast and need to go back to the previous step and increase more slowly. Lets Talk: Your dog relies on you to be able to read his body language to tell when he is feeling relaxed, and when he is feeling stressed. This dog is stressed , noted by his lowered body and head, ears back, paw raised, mouth closed, eyes on hand. a) Signs of relaxation: a relaxed body posture, relaxed open mouth, slow relaxed panting, slow, loose wagging tail, readily responds to petting and talking from owners, readily accepts treats and remains loose jointed. b) Signs of stress: rapid panting (when not hot), drooling, shaking, yawning, “shaking off” as if wet, lifting a front paw while leaning away, licking lips often, sniffing at the ground, whining or growling, hesitant to take the treat or takes it very roughly. Timing is critical, the timing of your treat delivery can mean the difference between success and failure with your CC/DS program. Your dog should be happily snacking the entire time your friend or groomer is touching him, as soon as they stop petting, the treats should disappear. This will allow for your dog to easily make the association that handling means yummy treats, no handling means the yummy treats go away. Make sure to pause several seconds in between each treat delivery/body handling episode before starting again, this will allow the message of “hands = good food” to really sink in. This sounds easier than it is, you will need to practice to set your dog up for success. Pay for petting is a method I like to use to change a dogs association to being touched. This is great for dogs that have nipped a hand that came at them. Start with someone the dogs knows well, they pet the dog under the chin, then feed a treat. Pet the dog on the side of his face and over his eyes, then feed a treat, look in each ear then feed a treat. Repeat this process while increasing the time you are petting or the body part you are touching. Repeat over and over using the dogs meals so that a hand coming at his face is not scary anymore. Make sure to use high-value treats (ideally that your dog doesn’t get for any other reason) such as boiled chicken breast, liverwurst or cheese. The higher value the food items, the faster the positive association will be made. You can also use a longer lasting treat such as a Kong, hollow sterile bone or Dixie cup filled with peanut butter or squeeze cheese. If using something like this, hold the container right up to your dog’s face the entire time you are handling his body and remove it as soon as the handling stops. Frequent training sessions of about ten minutes, rather than trying to do a long body handling session is best. Remember, you are trying to take it slow and make it fun for your dog. The Time Line at which you get through this conditioning depends on how stressed or anxious your dog is as well as how quickly he or she rebounds. Some dogs change very quickly and begin to seek out touch. While others do not seem to be able to change and need this conditioning with every new person they meet for many years. The end goal is not for your dog to seek out every hand, but to feel relaxed when a hand comes at him. 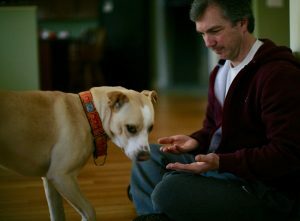 When this program is done correctly, your dog will begin to associate a hand coming at him as a source of good things. Because you use high value treats, your dog might even begin to drool rather than growl. Tip: During this desensitization training period it is important to avoid putting your dog in a situation where he might bite or snap. Exposing your dog to the scary situation while trying to counter-condition him, is going to slow your progress. 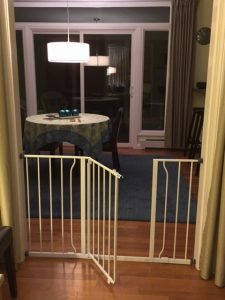 Judy’s recipe to help you change the behavior of your territorial dog. These are dogs who rush and bark at people through windows, fences, and at the door. 1. Management means changing the environment so your dog is not put in situations that trigger his fear or pushes him over threshold. As any new negative experiences can make his fear worse. It also means preventing him from practicing unwanted behaviors so that they do not become a habit. 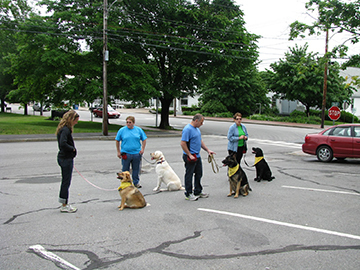 Good management should be practiced while you train and desensitize your dog. 2. How to read your dog is an important step in changing his behavior. What are your dogs stress or warning signs? What signs does your dog use to tell strangers they would like to have more space? Have you observed your dog looking, or leaning away, growling, whale eye (whites of eye shows), head up with a frozen forward stance, air snapping, or barking at a person? If your dog is lunging at people, then you or a previous owner have missed his lower level warnings and allowed people to close, now he has to protect himself. Low level Distance Cue: Leaning and looking away. This child received a bite to the forehead because her humans did not know this dog was using a low level distance cue. Learn your dogs stress signals, so you can support your dog. Low level distances cues should never be punished, as this can result in a dog that is not allowed to express his fear, hence he may bite with no warning. Looking away from a person, turning muzzle away, turning neck farther away, closing the mouth, ears go back, brow may furrow, dog becomes still and possibly stiff, and the white of the eyes often appear. This is when YOU need to support your dog by calling them to safety or stepping in to reduce their stress. Remember, not all dogs have the same tolerance, your dog may wait three seconds before they bite when stressed while another dog may be more tolerant, waiting 10 seconds. Knowing your dog’s stress signals is essential to his or her success. This is a very good warning to respect, correcting a dog for being afraid of people never works. More serious distance cues are more obvious and may include growling, freezing, lip curling, show of teeth, air snapping, lunging and rapid barking, standing tall and motionless with direct eye contact. If a warning did not work, the dog may feel the need to bite to keep himself safe. If your dog skips this warning, it is possibly because he did not have time to give another warning or possibly your dog is not tolerant at all and will react much quicker as his nature. 3. 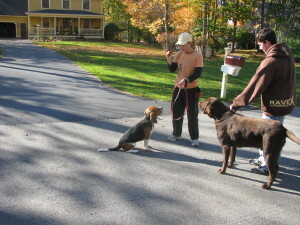 Training or desensitizing and counter-conditioning (CC&D) is a wide spread behavior modification technique, whose ultimate goal is to change the emotional response (which leads to an overall change in the dog’s approach to the subject) towards a given “trigger” that caused the dog to react in the first place. Counter conditioning is a classical conditioning approach where we pair something that created an unpleasant or scary response with something highly rewarding to the dog. If you use treats in various different exercises where your dog has no fear, then your dog most likely has a positive emotional response to the presence of treats which creates the opposite of a fear response. If at any time during your training, you dog stops eating, then slow the progression down, take a step back in your training. This is your dogs way of saying I am not comfortable with the current situation to eat. Using positive reinforcement training to teach your dog some emotional control can be very effective with territorial dogs. 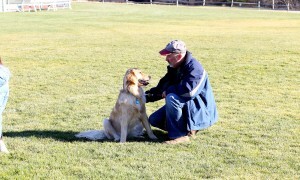 Teach your dog to sit and stay in different environments to help your dog see you as their leader. Any dog who has a good leader built on mutual trust will progress faster through this recipe. So be a good pack leader to your dog and ask many behaviors throughout each day and reward with food, toys or affection. These dogs are more likely to look to their leader for guidance when a guest arrives. Emotion control practice in neutral environments is hugely helpful for territorial dogs. Train a sit/stay while people pass on the street or local park, practicing so your dog can be successful is essential to your dogs success. Always begin each training session in an environment where your dog is calm and below threshold. Progress to environments closer to home, your street, driveway and in the home. Train a strong “come” or “here” to be able to call your dog away from a stranger when you see stress signals from your dog. Simply take some bits of cheese in your hand and say the cue word “here” when you dog looks at you, say “yes” and toss him a treat. Walk away and repeat “here” say “yes” as he begins to come to you and reward with five or six pieces! Practice in multiple situations and always be generous with the reward. 4. Proofing the behavior gives you the knowledge of how he will respond to a particular stimuli in different locations or situations. When I have proofed my dogs behavior in many different situations, I have verification or confirmation that I know how he is going to respond. If you are thinking your dog “reacts differently in different situations” than you need to slow your process down and get to know your dogs stress signals better. You are most likely missing some warning cues. Keep in mind, every dog will progress at a different pace, this pace is set by the dog. Factors that effect how your dog responds can include many variables, such as how a person smells, moves, height, gender, if they make direct eye contact, are nervous, if they lean forward, or stomp their feet, how long they are near, just to name a few. year to finally trust tall men and my scottie nearly double that time to trust any human, as she was five when I adopted her. She also came to me with an 8 bite history and two police reports in her file. Unfortunately, her previous trainer shocked her when she growled at people — yes, this did make her much worse. With Counter Conditioning how she felt about people, she began to see them as a predictor of good things and safety. 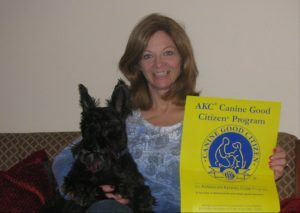 You can imagine how gratifying it was when she passed her Canine Good Citizen Certification by a trainer she had never met before. Parenting a territorial dog is a process, stay positive and celebrate the small successes with your dog. Is your dog predisposed to separation anxiety?